This book is a compilation of six booklets. I will attempt to give a brief overview of them. 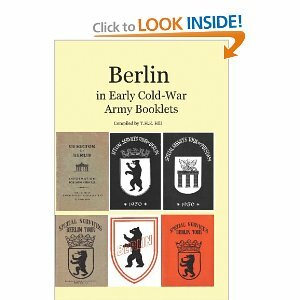 The first booklet “US Sector of Berlin” is a guide for the service men and their families. It gave me insight into the daily lives of these men and women. The booklets discussed everything from what to expect upon arrival to the end of their stay. This is not an official document but was used as a souvenir. One thing I found most beneficial was the list of emergency phrases. “Special Services Tour of Berlin” is a historical trip that takes us to some of the most beautiful buildings and areas with a brief history of the area. “Special Services Tour of Potsdam” is similar to the previous booklet. Here the reader can visit the market square, the Neue Palais to the Palace of Sans Souci. If nothing else this booklet wets the appetite of those like me who will use this info to do more research. “Special Services Berlin Tour” is an updated version of the 1950’s booklet. I not only enjoyed the updated information but the information which describes what the buildings were originally used for and if they had been rebuilt. There was a wealth of information for shopping including some of the best places to find jewelry, leather goods, etc. I loved the unique phone numbers. “Berlin” is an informational booklet that compares east and west Berlin. It demonstrates how the western half helped speed recovery for the people while the eastern half slowed down that recovery through socialism. “Special Services Berlin Tour” is the third booklet with updated tour info.